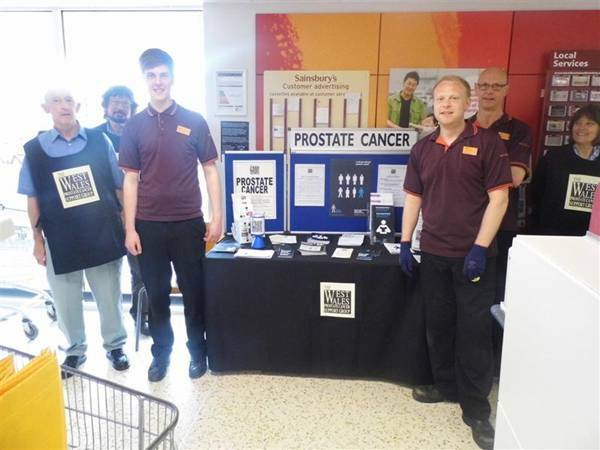 TWWPCaSG raises awareness of prostate cancer at Sainsbury’s Store, Lampeter, 14 June 2014. In the background left to right are members Alun Jones, David Parmar-Phillips and Di Bell. In the foreground are members of staff from the Store. The event also raised in excess of £260.00 for TWWPCaSG. Our thanks to Kayleigh Holt, Sainsbury’s Community Ambassador.